Founded in 2011, Twitch is rapidly becoming one of the more important marketing channels in the video game industry. The site draws roughly 60 million fans every month to watch on-demand and live streams of other users' gaming exploits. As such, the site now gobbles up more primetime internet traffic in the U.S. than any other website except Netflix and YouTube. And last September, its successes cemented further when Amazon acquired it for $970 million, representing the retail giant's asserted leap into the gaming arena. In the three and half years since it started as an offshoot of the general video-streaming site Justin.tv, it has also evolved into the premiere location to view U.S. eSports competitions for MOBA games such as League of Legends and Dota 2. In short, Twitch is the ESPN of live gaming. However, Twitch is evolving into much more than the hub of eSports and a way to view others' gaming exploits; the channel is evolving into an entertainment hub with a focus on games. Examples of this diversification include channels showing game development coding, music streaming, and game previews. To investigate the growth and diversification of Twitch, EEDAR collected the number of views by game for the top 100 games at every half hour interval throughout Q4 2014. When aggregated, this metric provides a sense of both number of users and their length of engagement, a metric which EEDAR calls "view volume." EEDAR estimates that the sample of games that reach the top 100 games (n=2791) accounts for 99 percent of the stream traffic on the site for Q4 2014. 1. Twitch is not just for eSports and PC games. 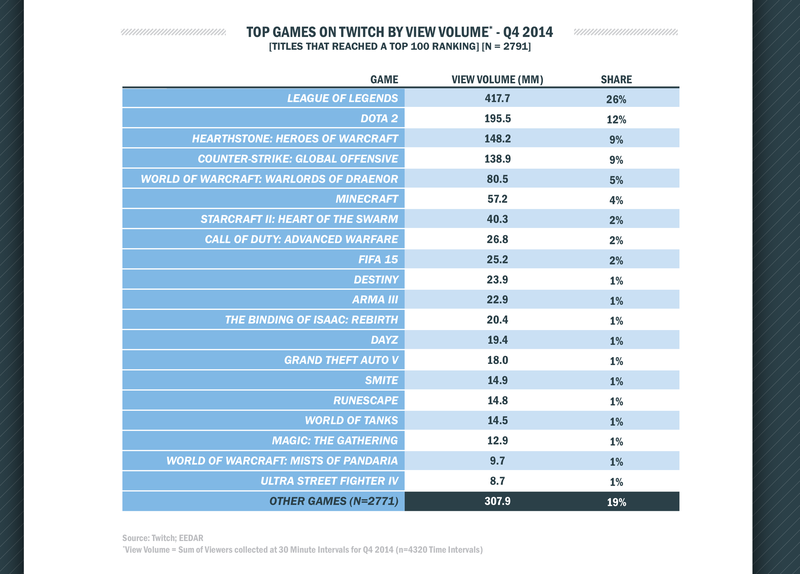 The following table shows the top 20 titles on Twitch ranked by total view volume in Q4 2014. Although a quick glance at the top of the Twitch rankings shows how much of the share of view volume is driven by games with strong competitive multiplayer and eSports communities, many titles in the top 20 are titles that offer other types of gaming experiences. For example, the top 20 includes games where the primary experience is driven by building and sharing (Minecraft), MMORPG gameplay (World of Warcraft, DayZ, RuneScape), single-player open world experiences (Grand Theft Auto V), difficult arcade gameplay (The Binding of Isaac), and co-op loot collection (Destiny). In addition, Twitch initially was a content site for mostly PC play, but many of the top 20 games, including Call of Duty: AW, FIFA 15, Destiny, and Ultra Street Fighter IV are primarily console experiences, with several being console exclusives. 2. The top of the viewing charts are dominated by 5 titles with strong competitive multiplayer communities. These titles drove 61 percent of the view volume in Q4 2014. While Twitch is becoming a more diverse content channel, the top multiplayer games that have strong eSports communities and operate as an ongoing game as a service (GaaS) drive a large percentage of the overall traffic. 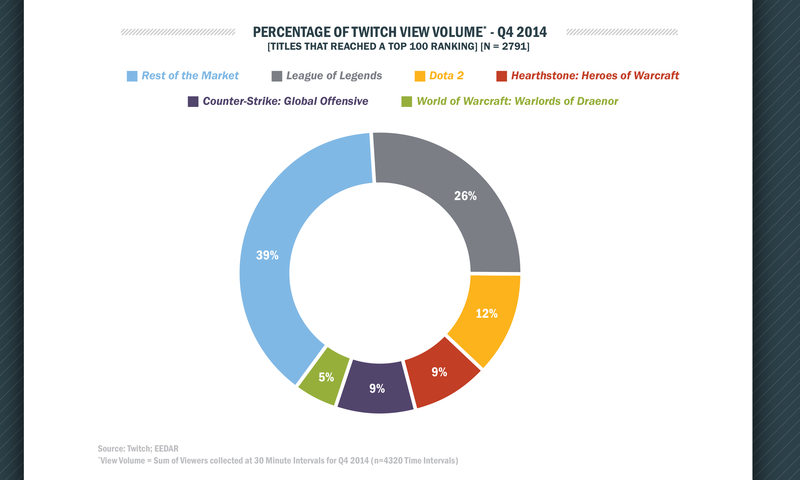 Interestingly, while League of Legends has almost double the share of Twitch view volume as Dota 2, Dota 2 over-indexes compared to the overall size of the respective games, as League of Legends has approximately seven times the monthly active users as Dota 2 (70 million compared to 10 million). This is likely driven by Twitch being a primarily Western Market product and by Dota 2 having a higher percentage of users that are interested in competitive play (League of Legends is considered the more accessible of the two games). 3. However, there is still a lot of movement at the top of the charts on a daily basis. While there is less movement in the top ranks on a month over month basis as the games with the strongest ongoing multiplayer communities drive consistent traffic throughout the quarter, an analysis of the rankings on a daily basis shows how events and specific channels can drive a high volume of views. The table below shows the daily view volume rankings for three dates near the beginning of three months: November 2014, December 2014, and January 2015. An analysis of the top rankings on a daily basis shows that, other than the consistent top performance of League of Legends, there is a shifting among the titles in the top 10. In addition, each day has several titles in the top 10 that do not appear on the other days. 4. Community events, game launches, competitive tournaments, fund raisers, and Twitch personalities all provide opportunities to temporarily drive a high amount of views. The three specific dates in the chart above were chosen because they demonstrate three of the ways titles can explode up the charts for a limited time. - Call of Duty: AW released on November 4, 2014, temporarily displacing the eSport-focused CS:GO as the top Shooter. - Ultra Street Fighter IV held the Capcom Cup tournament sponsored by Capcom launching Ultra Street Fighter IV into the top 10. - From January 4th to January 11th the Awesome Games Done Quick charity channel (#AGDQ2015 Benefiting the Prevent Cancer Foundation) pushed many older games into the top 10. On January 9th, this included Spyro, GTA: Vice City, and Trials Evolution. Another way that games rise in the ranks for a short period of time is based on the power of channels run by content streamers who have become Twitch personalities with fan followings, similar to how PewDiePie has become a personality on YouTube. For example, the game Painkiller: Recurring Evil, a game that typically does not track in the top 100 streaming titles was able to vault all the way to number 7 on December 19th, when the popular Twitch personalities, Yogscast, switched their channel to stream the title. 5. 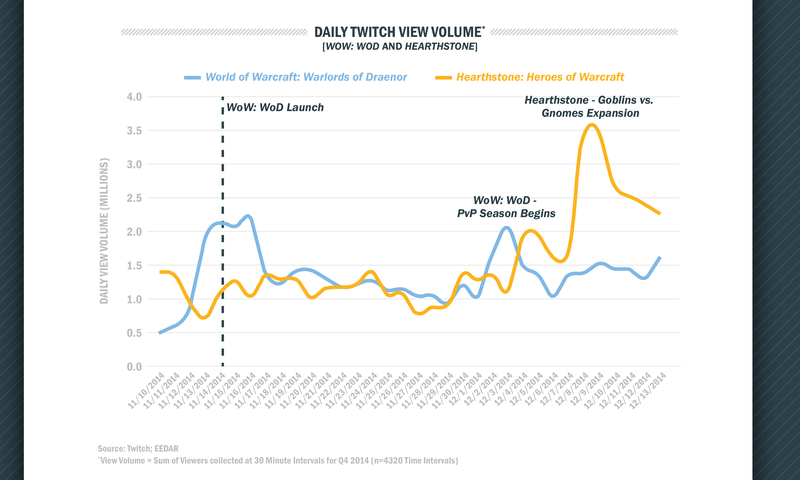 The release of a major title temporarily disrupts the traffic of major Twitch games in a similar genre. The following graphs show the daily view volume of an established market leader in Twitch viewership compared to a new release with an overlapping fanbase. The data suggests that new releases, events, and marketing initiatives have the ability to pull viewers from an established game for a period of time. 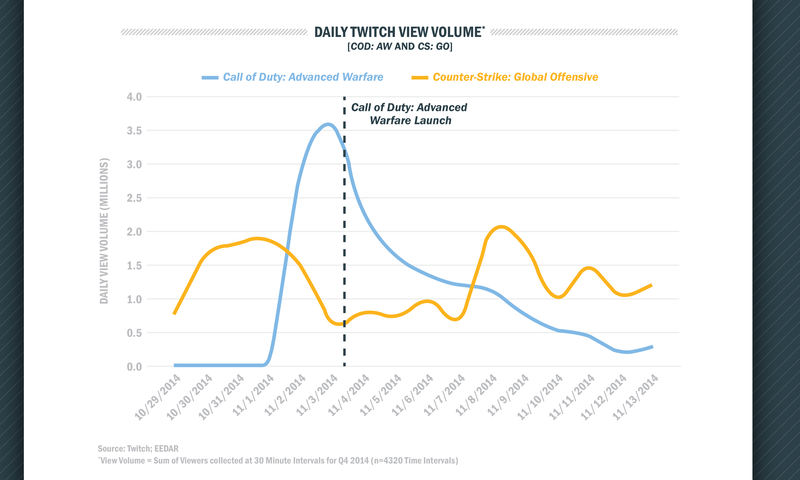 The first graph shows how Call of Duty: Advanced Warfare temporarily displaces Counter Strike: GO as the largest Shooter on Twitch for the five-day period surrounding its launch, and the second graph shows how World of Warcraft: WoD displaced another high-ranking Blizzard title, Hearthstone, in the four-day period around its launch. Hearthstone has only returned to pre-WoW levels in mid-December after releasing an expansion, Goblins vs. Gnomes. As Twitch continues to diversify and expand its content offerings, the opportunities for a broader range of titles to use the platform as a marketing and content tool will only continue to expand. In some ways, the top of the Twitch ranking charts appears similar to the top of the mobile charts, in which month over month there is very little change in the established titles. However, a closer examination of the daily rankings and title-level view volume data over time reveals that the platform presents a lot of opportunity for smaller titles if they create attractive content, updates, and events.